You are probably having trouble playing Mass Effect 3 with your gamepad or joystick. 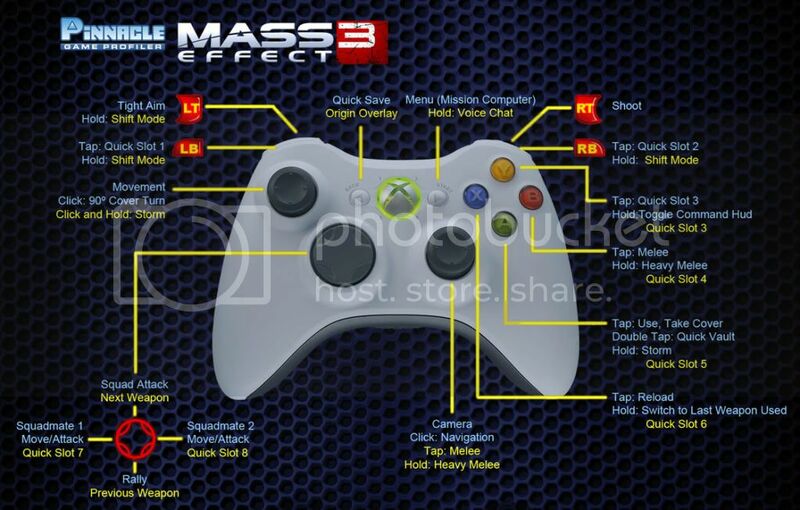 a pre-made profile for Mass Effect 3 controller support. Simple. This is yet another ME3 profile based on my ME2 profile. I've been testing it all day, comparing it with Errol & JCKarlo's profiles to use the best of their ideas. With my profiles the goal is to try to get as close to the console versions as practical. I have the ps3 version of the game, so I have been comparing this profile against that version to capture the feel as closely as possible. However, ME3 was designed with the PC in mind and utilizes a totally different Command HUD, along with quickslots, so my profile was designed with all this in mind. - I've decided to use RB for the Command HUD, which is sticky. I prefer to leave A for sprint, and X for reload, and LB is used for the shift key. It feels quite fluid. When you hit RB, the mouse pointer will drop down to where your powers are. Keep in mind, this will change somewhat based on your screen resolution. If you don't like where the mouse pointer ends up, you can modify that in PGP. - Camera Panning speed matches the ps3 version exactly. - While in the Command HUD, right stick controls the mouse pointer. To pan the camera, hold down the left trigger while the hud is up. - I've enabled the D-Pad to navigate while you're in the pause menu, in addition to the mouse pointer via right stick. - On the ps3, Y enables your 1st quickslot power. Therefore I've done the same. Whichever your main power is (ie cloak for an infiltrator), assign it to quickslot 1 in-game. Aside from quickslot 1, every other quickslot is on a shifted face button or D-pad. - During the game, every now and then an eyeball prompt will show up on the screen, indicating you should be looking at something. When this prompt comes up, hold down Y to view it. I saw this as a better solution than leaving it on Back, so you could walk and view at the same time. - Walk is enabled, move the left stick slightly and you'll walk slowly. *You can click on the thumbnail for a quick look at the layout, though I've detailed the layout with explanations below. The D-pad covers squad orders. It also works to navigate while you're in the pause menu. - On all my profiles, I assign quick slots going clockwise, beginning with the bottom key (A for the face buttons, Down on the D-pad). They're also assigned to shifted keys. But remember, quickslot 1 is assigned to Y so in this case, we begin with quickslot 2 on Shift/A. Center Command HUD Pointer - Right Thumbstick (Useful while the Command HUD is up). *Should be the same as ME2, I'm not far enoug in-game to test these yet though so if you have issues, let me know. This oughta cover it. You should still look over the imageguide to cover any commands I may not have mentioned. It's not exactly like the console but it's close, and I tried to keep all the non-console stuff as logical as possible. Enjoy! Made for Nosar and Mystieus. Special Note: OK guys I did another profile for Mass Effect 3 but less complicated, only one Shift Mode. I see most of you prefer the quick slot assigned to the A, B, X, Y, buttons so I decided to do it your way. I've practically done over the whole profile so feel free to use and modify, both links are above. Some of the key features I added to the new alternate profile are sniper assist to get a better aim to hit your target and also adjusted the sensitivity to both analog sticks. For those who do not know, this game don't have Shepherd to Jump but he can make more like a hop or small leap or mini jump if I can call it that, so tapping the right shoulder button will make him do those things. Also you can use the same right shoulder button to prolong your life when its needed i.e. for the new profile I made. The original profile you'd have to use the A button to get the same feature. Tap to Reload and hold to go into Shift Mode. I also added the arrow keys for menu navigation on the D-Pad by Shantd recommendation. This is my first profile upload, so please bare with me if there are any snags along the way. I began playing Mass Effect 3 with Errol's profile which I found intriguing, but a bit overly complicated. I decided to alter his original setup and set the controls up as close to the console version's controls as possible, but with the added bonus of shift buttons for easy access to all of your powers. * (3/13/12: Made a slight update. You can now melee by pressing the right stick in while in shift mode. This should allow you to do running melees) *This had no real affect, but left it in. A) To have RB as run/cover/use. I know some people like to use A, but using A prohibits the ability to run and look at the same time so I prefer RB. The ability to control the camera while running is especially important for the many platforming and combat parts of this game. B) Have all face buttons ABXY used for special abilities. This makes the game fast and deep as you have to learn combos to handle different types of enemies without having to pause the action. Reload is click left thumbstick. I know a lot of people like to use X, but for this game I wanted to reserve face buttons exclusively for special powers and right thumbstick for stabbing people since Shepherd is right handed, and clicking the left thumbstick to reload actually feels good in my opinion. Clicking the right thumbstick is used for melee and holding right thumbstick delivers a heavy melee with the sword. I wasn't sure if that button would work well, but it turns out that it does. It really feels like you are stabbing a guy when you run toward somebody holding the right thumbstick down while the controller shakes and Shepard delivers a lethal blow. You could not perform this action very smoothly if you used A to run. One more new feature is called cover turn, this allows you to sneak around corners. To accomplish this, simply press and hold the left thumbstick while you are behind cover. Another new feature is Navigation. This button points Shepherd in the direction he needs to head or brings up a map. You can use this feature by holding "up" on the Dpad. One more significant addition is the voice chat. I have not tested this yet but you should be able to press the back button when you want to turn on chat and press it again to turn it off. If this feature is not working properly, please let me know. I will probably make some tweaks in the near future but I wanted to get a profile out for everyone as quick as possible. If the profile does not work for you, try editing the executable directory. You can now point the cosshairs in HUD mode using the left thumbstick (no need to hold left trigger). Right thumbstick still just controls the mouse. Hello all...I'm new to the PGP forums but I've been using PGP for a while now. I thought I'd share my profile for Mass Effect 3 (XBox 360 controller) that I've used since the ME3 demo and works well in the full game as well. The profile is a modified version of BarryDingle's wonderful ME2 profile, but I've made some tweaks which I think further improve the playability. The key feature is the command HUD system. By holding LB, you bring up the HUD, but it also triggers a shifted control layout for the analog sticks. I've set it to feel like the console version where the right stick will move the screen around (without having to hold down the left trigger [right click]), while the left stick will only move the cursor to select the powers/weapons. Pressing down on the left stick brings the mouse position to the bottom center so you don't have to move it to the weapon/power icons manually -- you may have to tweak this depending on your screen resolution (ideally if you're on a 1920x1080p screen, the coordinates should be X: 960 Y: 1050). You can also give squadmate orders in this screen with the D-Pad. Another important feature is using RB, Y, X, and B as the 8 quickslot buttons, while keeping A the action/sprint/select. I generally like to reserve the first four slots (RB and Y) for Shepard, and X and B for squadmates (corresponding with D-Pad left and right which gives them orders). For me, RB and Y felt more efficient as the first four quickslots that I reserve for Shepard, and it's easier to remember during larger fast-paced battles. One last small improvement was adding the ability to walk when you tilt the left stick less than 50%. **Before using, change the in-game key bindings for movement to the arrow keys. I'm not sure why BarryDingle did this in his ME2 profile on which this profile is based, but I never bothered to revert it to WASD. I find this profile fun to use, especially with using all 8 quickslots without having to go into another shift-mode. You spend less time on the Command HUD, but when you open it, it feels like the console versions. I hope you enjoy, and tweak as you please! Again credits to BarryDingle and his ME2 profile that inspired this! [*]The back button is the command HUD. LB and RB are quick slots two and three, and holding one down will switch to the previous/next weapon respectively. [*]There is a rumble effect that occurs when attempting a melee or firing a weapon, as well as when selecting commands. [*]While the command HUD is open, Y will cycle through Shepard's powers and weapons, X through first squad mate's, and B through the second squad mates. LB and RB will cycle through quick slot 1-3, allowing easy reassignment of real-time power use. Pressing right thumb will place the mouse dead in the cross-hairs. This feature will only work at a resolution of 1920x1080, and due to a bug with Pinnacle at time of posting, may not work without restarting PGP. [*]Pressing the guide button will switch the controls to a conversation mode and back. This removes rumble effects, makes menu navigation easier by hot-linking the mouse to the four button controls near the bottom of all menus (if you've played ME3 on PC, you know what I'm talking about), as well as the journal, squad, save and load screens. Bumpers, B, and Y buttons navigate. Thanks to Author Pinnacle [Errol] for the original profile that I used as a template.